Silent, deadly, and destructive, creepers are probably the most dreaded mob in Minecraft. Fittingly, the creeper has a twisted and horrifying past that ranges all the way back to one of the first editions of Minecraft. This piece originally appeared 11/23/16. The creeper is one of the oldest entities in the franchise: it was the first enemy mob added in the survival test in 2009. Creepers were never meant to be in the game, though. According to creator Markus “Notch” Persson, he was originally trying to create a pig. Inspired rather than horrified by the monstrosity he had created, Notch added a green texture and some aggressive behaviors and threw the creature into the alpha version of the game to torment players for years to come. For a while, it seemed like creepers would remain an afterthought, with little more than a placeholder texture and behavior that was mostly a copy of the way zombies behaved, but— possibly because of how many unfortunate players lost their lives, loot, and bases to creepers— they eventually got a new texture, sound, and unique behaviors (here’s a recording of the old creeper sounds, which are lot less horrifying than the current hiss-boom). Early on, creepers would charge right at players like zombies and only explode when killed, but Notch decided that wasn’t maddening enough and made the explosion their baseline attack. Fans of Minecraft developed a love/hate relationship with this iconic mob from the very beginning. The “That’s a very nice [X] you have there, it would be a shame if something happened to it” joke is probably the oldest Minecraft meme in existence (using ‘sssSSSS’ as an interrupter is probably about as old, but hasn’t had the same persistence). Some of the earliest Minecraft fan videos are expressions of frustration about creepers, like Rocket Jump’s Minecraft Massacre, though perhaps an equal amount of effort has been spent on trying to understand the tormented creeper. Hilariously, creepers could also damage players and objects in creative mode through the end of beta. It took several patches for the devs to iron out creeper-related bugs like that one, and every now and then a new one would slip through. For a short while creepers would explode after falling, which meant players were literally being dive-bombed by unavoidable, completely silent exploding mobs. After a few patches, Mojang decided that creepers weren’t quite unpredictable enough and added a way for them to become even more destructive: if struck by lightning, creepers become charged and explode at twice the force. Don’t let the fact that you are unlikely to ever encounter a naturally charged creeper soothe you into a false sense of security, because it happens when you least expect it. Weirdly enough, mobs killed by a charged creeper will drop heads that can be worn as disguises, causing some particularly deranged players to actually seek out the glowing monstrosities. Creepers, aside from cosmetic changes, are still basically the same mob that they were at release, but, ironically enough, they have a long and storied history of wreaking havoc on the code as well as on players. Getting creepers just right, in terms of behavior, power, and interactions, has proven to be pretty sticky for developers. For a while, other mobs would run away from creepers, but this behavior was removed, presumably because it was causing undesirable AI interactions. Iron Golems — which are supposed to protect villagers from mobs—still ignore creepers because otherwise they’ll blow the village to pieces. Most of these bugs have been addressed in the Java edition, but the latest MCPE patch was delayed for almost a week because creepers were exploding through doors and ruining survival players’ hard work. The legacy of this particular monster was so immediately iconic, that in 2011, the Minecraft logo was updated to include a creeper face, and it’s stayed that way ever since. Some of the very earliest Minecraft merch were creeper plushes, and in 2016 that’s expanded to include t-shirts, toys, hoodies, and, for some reason, Bible covers? And yet, Notch’s cruel disregard for his creation continued as long as he was at the helm of Mojang. 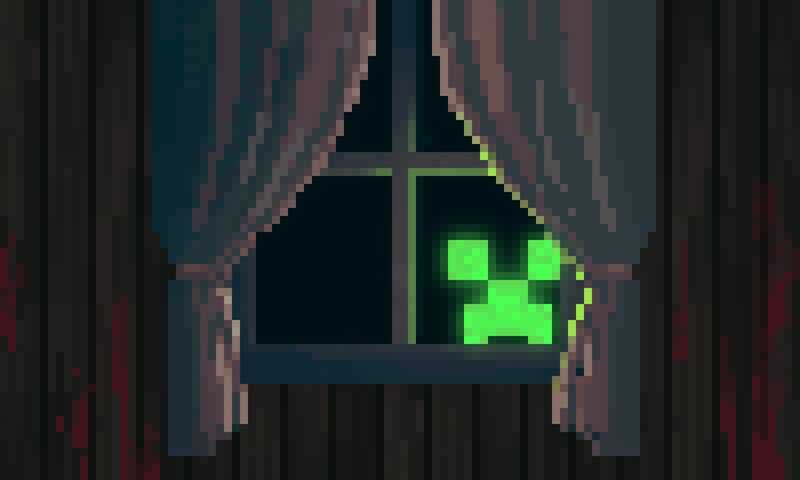 When asked to describe the creeper, Notch said that he always thought of them as “crunchy, like dry leaves,” but that he doesn’t know why they explode. I like to imagine that it’s because they’re filled to bursting with the burning shame of being discarded by their maker, but maybe that’s being dramatic. So the next time a creeper blows a hole in your house or ends your five hour spelunking expedition with an ignominious plunge into a river of a lava, spare a thought for the poor creature, lurching through the world of Minecraft like an abandoned Victorian monstrosity, malformed by fate and unloved by all, doing the only thing that it knows how to do: kill. Rob Guthrie is a lapsed academic who writes about history, video games, and weird internet things. Follow him @RobertWGuthrie for pithy Tweets and lukewarm takes.